Jamnalal Bajaj (right) and Subhas Chandra Bose at Satyagraha Ashram, Sevagram, 1936. Subhas Chandra Bose(right) at Wardha, 1936. Subhas Chandra Bose (centre) and others. 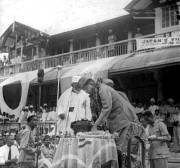 Subhas Chandra Bose (right) during Haripura Congress, February 1938. Subhas Chandra Bose (centre) during Haripura Congress, February 1938. 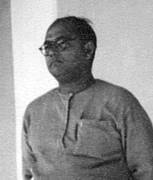 Subhas Chandra Bose, c. 1940. Subhas Chandra Bose during an Indian National Army function, c. 1943. Lakshmi Sahgal ("Captain Laxmi"), officer of the Indian National Army, c. 1943. Young men standing in a cordon next to a plaque saying "GANDHIGOY, B.Y.T.C." Soldiers of the Indian National Army in German Wehrmacht uniform, c. 1943. Indian National Army exhibition, c. 1943.